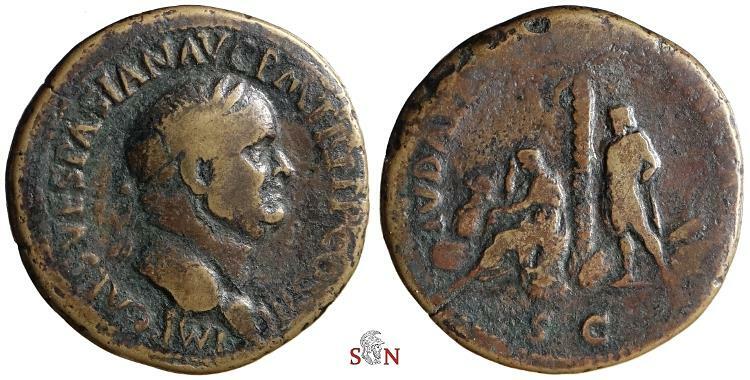 Vespasianus Sestertius, struck AD 71 at Rome mint. Obv: IMP CAES VESPASIAN AVG P M TR P P P COS III, laureate head right. Rev. IVDAEA CAPTA / SC (in exergue), Jewess seated left on cuirass under palm-tree in attitude of mourning; at her left, two shields. Behind palm, Jew standing left, hands tied behind his back; in field right, pile of arms. RIC 426, BMC 540, C 238.